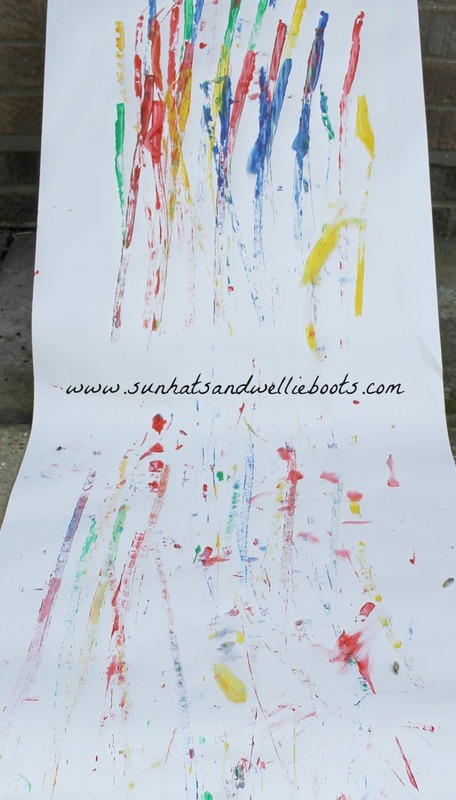 I love an art activity that enables children to paint in a new way, & this fun activity does just that! Plus it involves lots of movement too, so it's great for developing motor skills whilst getting creative! This is a perfect indoor or outdoor activity, although if you're considering doing it indoors perhaps a hard floor that can be easily cleaned is better than a carpeted one for this! For our action art we used mini skateboards which we purchased from Poundland. They're around the length of a child's foot but not strong enough to take their weight as they're designed to be played with by hand, which makes them ideal for this activity! 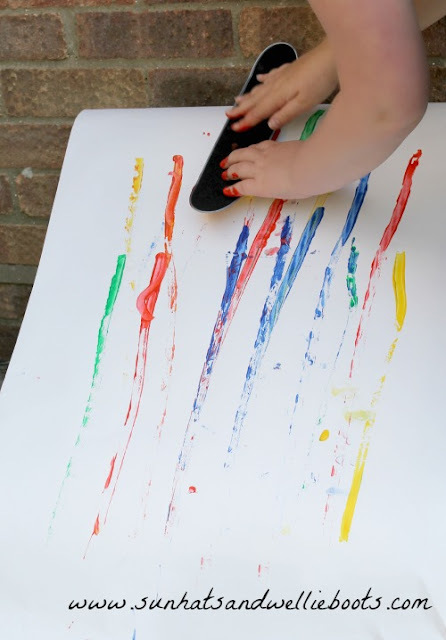 For our painting canvas, we used a roll of paper & cut a section long enough to cover our cardboard box and enough to trail on the floor too. 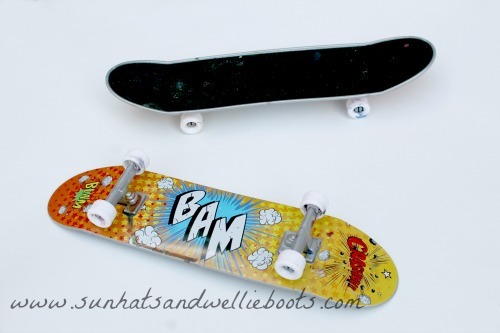 We then lent the box against the wall to create a ramp for our mini skateboards to roll down. We used a selection of tempera paint & painted each of the wheels with a paintbrush. This was initially a little tricky as of course the wheels moved round, but Minnie soon discovered that if you brush the paint across the wheels sideways the wheels spin less & you can add much more paint. Once the paint was on we were ready to roll! 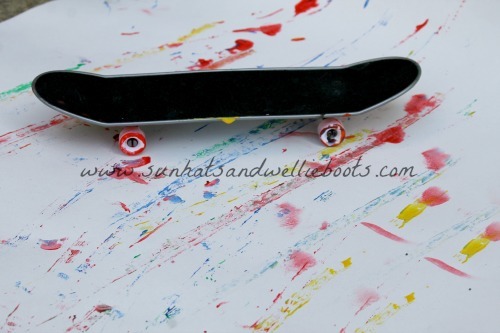 We placed the wheels of the skateboard at the top of the ramp, gave it a push, & watched as it sped down leaving its rainbow coloured tracks behind it. When you've done this once of course, you want to do it again & again! So painting the wheels as before but using different colours my mini artist set to work. There were some fine motor skills being used here, & some great prediction skills too. We also discovered that too much paint just left big blobs of colour & not the beautiful coloured stripes that she wanted. 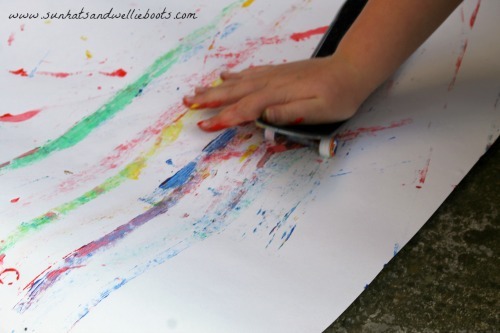 As the mini skateboard whizzed repeatedly down the ramp, the paint mixed with the previous colours on the paper & produced some gorgeous new colours as they blended together. 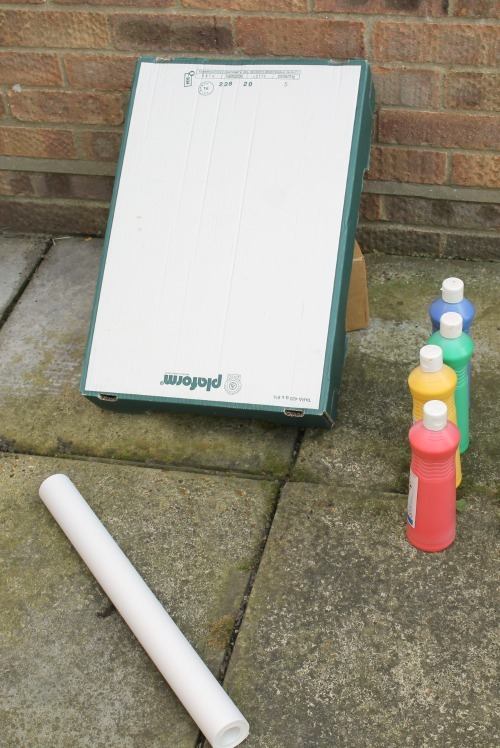 What a neat way to explore colour mixing & to see how many 'new' colours you can create using just primary colours. 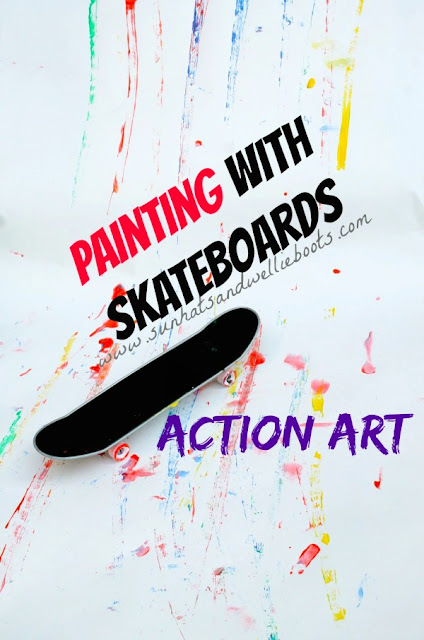 The beauty of this open ended activity was that Minnie was in control, exploring the paint & motion of the skateboard in her own way. 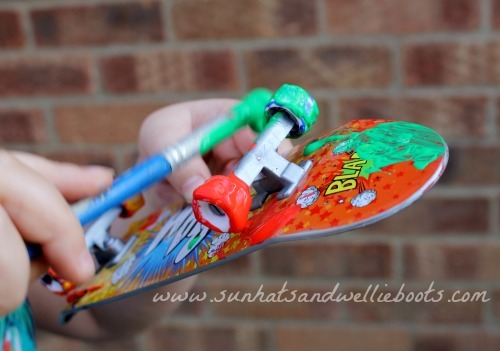 She tried her hand at a few 'tricks' with the skateboard too, wheeling it up & down the ramp with her hands, & then flipping one end of board so it spun up into the air, landing often on it's wheels! She also loved measuring the distancce the skateboard travelled each time. This activity has been a big hit here & we've since explored it using different sized ramps along with 2 skateboards which has been huge fun. If you're looking for a STEM activity that explores speed, distance, forces, construction, creativity, & encourages spatial awareness, control, coordination, estimating & predicting, then this is an ideal activity to share with children of any age.